Prodigious savants are extraordinary individuals who possess astounding abilities paired with challenging deficits. What is savant syndrome and how does it relate to autism? Savant Syndrome is a condition first recognized by Langston Down, the doctor who first documented Down syndrome. Dr. Langston Down described patients who had uncanny abilities paired with intellectual impairments as "idiot savants". He did express reservations about using the term "idiot" because it was gradually moving from an objective, clinical term to an insult among the general population. His definition of the condition is direct, noting that some patients who are "feeble-minded" have remarkable potential described as "special faculties" that can be developed to great magnitude. A person with savant syndrome has stunning abilities in concentrated areas while exhibiting significant impairments in others. For example, a savant may play complex compositions on the piano by ear but be unable to tie his shoes. The paradox between deficits and advanced skills is staggering and the condition is associated with autism for a number of reasons. Also among the fitting terms is "abnormal", especially considering the rarity of the abilities. A savant is a scholarly or wise person. A person can have both autism and savant syndrome, but this occurs very rarely. However, elements of being a prodigious savant apply to elements of autism. Just as pervasive developmental disorders appear to magnify certain traits like shyness, concentration and sensitivity to sensory input, savant tendencies appear to magnify the fixation on specific topics seen in many cases of Asperger's and autism. People who are not familiar with the autism spectrum of disorders may automatically picture Raymond Babbitt from the movie Rain Man. This character has shaped the way people see autistic disorders, but the perception is skewed. A man named Kim Peek inspired Raymond Babbitt's character. Kim is a prodigious savant, but he does not have autism. His skills and deficits result from corpus callosum disorder. The Rain Man character is not completely off the mark; Babbitt's character is based on autistic savants as well. Autistic savants make up roughly 10 percent of the autistic population. Though not representative of the majority of the population, savants with autism shed light on pervasive developmental disorders. A prodigious savant displays skills that are so remarkable that they would be classified as extraordinary or genius among individuals who do not have a disability. This differs from splinter skills and talents that are outstanding among individuals who have autistic disorders because the abilities are awe inspiring across the board, not just in relation to deficits. Splinter skills and talent are outstanding in contrast to the individual's limitations. Prodigy is remarkable among the most capable individuals. A person on the autism spectrum may have the ability to memorize things very easily, especially when it pertains to specific areas of interest. An example is an autistic individual who is able to remember the day and date of specific experiences: We went to the zoo on Tuesday April 11, 1987. A prodigious savant, as an exaggeration of this type of skill, may be able to calculate the day of the week a holiday fell on through the past 300 years as well as predicting the day of the week it will fall on in the next century. An individual with autism may be particularly interested in music, showing great skill in playing instruments or singing. Sometimes he or she is able to play music by ear and music therapy is a popular treatment for autism. However, prodigious savants may be able to play songs in perfect pitch after hearing them just once. In addition, a savant may create remarkable musical compositions. Drawing, painting and sculpting are among splinter skills that may be found in individuals with autism, as seen in talented people like, Kim Miller. Math skills can relate to rote memorization and this splinter skill may manifest in "lightning calculating" in which a person is able to solve mathematics problems as quickly as an electronic calculator calculates. The person may exhibit lightning calculating abilities but may be unable to solve 2 + 2. A person on the spectrum may be fascinated with mechanics and can develop outstanding repair skills. A savant may be able to fix machines that he has never seen before. Among the most interesting aspects of savant syndrome is the presence of skills that seem to appear out of nowhere, without the individual actually "learning" them. Ancestral or Genetic Memory: Factory Installed Software by Darold Treffert, MD examines the notion that the talents and abilities exhibited by prodigious savants may be inherited through memory. He compares the idea to Carl Jung's "collective unconscious". A child can inherit skills and talents just as he can inherit blue eyes. Dr. Darold Treffert has over 40 years invested in researching savant syndrome. 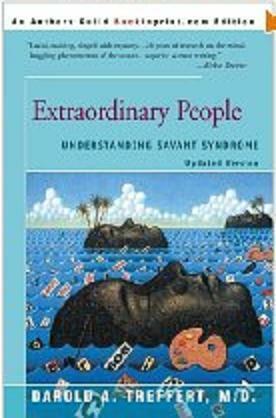 His book Extraordinary People explores the syndrome and his impact on the field of psychology is profound. His tribute to Kim Peek, who passed away in December 2009, can be found on the Wisconsin Medical Society website. The tribute gives readers a brief glimpse into the effect Kim's short life has had on people affected by corpus callosum and brain disorders. In addition, Treffert and Peek helped to develop Rain Man, a character who brings together prodigious savants and autism.